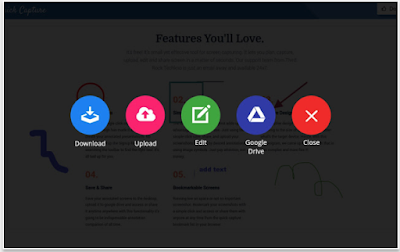 Quick Capture is a great Chrome extension you can use to take screenshots of your current page. We have been experimenting with it for awhile now and we found it way better than the other tools we have been using (Lightshot and Monosnap). One particular feature we like the most about this app is full-page screen capture. With a single click, Quick Capture generates a screenshot of the whole page. It also offers a wide variety of tools to annotate and edit your screenshots. You can add text, shapes, arrows, edit using a pencil or brush, crop specific parts, add emojis and many more. Once your screenshot is ready you can save it to your Google Drive, your local hard drive, send it to Slack or save it to Quick Capture.You can save your captures to Quick Capture either as a guest without having to sign up in which case your captures are stored for 10 days only or you can sign in with Facebook or Google and save your screenshots with a free storage for 30 days. For us, we download our captures straight to our computer’s local drive. Quick Capture offers you 3 screenshot making options: you can capture only visible part of the page, the entire page, or use delayed capture which gives you 3 seconds before the capture takes place. The way this tool works is simple and easy. First you need to install it on your Chrome browser, then once you are in a web page you want to take a screenshot of click on the tool’s icon on the top right hand corner and choose which screen capture mode you want. Next you will be directed to a page where you can edit and work on your screenshot. 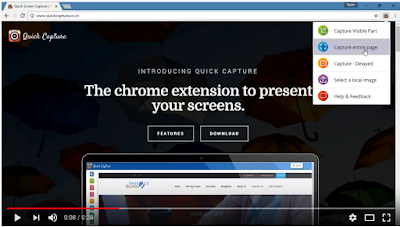 Watch the video below to learn more about Quick Capture.